Mechanochemical reaction of Fe–C is achieved in Ni–Cr–Mo steel during surface mechanochemical case carburizing treatment (SMCT) at room temperature. Gradient nano-carbide layers are formed in the surface and near surface up to few microns. The Ni–Cr–Mo steel was treated for 15, 30, 45 and 60 min, respectively, to find out the alteration in microstructure. The surface and cross-sectional microstructures were investigated by Olympus optical microscope (Japan), 6390-A scanning electron microscope and JEOL F-2100 transmission electron microscope (TEM). 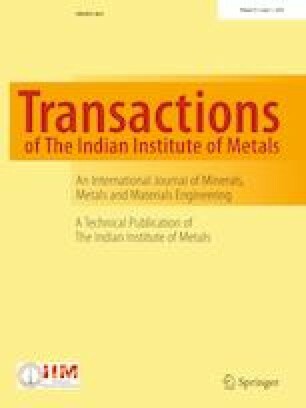 It is observed that mechanical alloying of carbon in iron lattice is achieved and surface carbon concentration increased from 0.17 to 0.8 wt% with 1 hour of SMCT operation time. The mechanochemical reaction between Fe and C produces Fe3C (cementite) in the surface and undersurface up to 500–800 microns along with nano-particulate on the surface and near surface in 1-hour operation time. It is observed that the carbide cell blocks (CB) and geometrically necessary boundaries (GNB) are produced due to severe plastic deformation created by SMCT operation. Authors are thankful to Director of MANIT, Bhopal, for providing the characterization facility to complete this study. The microstructural study would have not been completed without the TEM analysis; hence, authors specially thank Central Testing Facility Center of IIT Kharagpur, for their kind help for TEM sample preparation and testing.